Our half hour was up so we hover taxied back to the flight line and landed. He filled out my pilot's log book with half an hour of dual helicopter instruction. Whoo hoo! That is SO COOL!!!!!! I've always loved helicopters and actually have an RC model. It's extremely hard to fly. They say the bigger ones are easier than the little ones but if I make a mistake it just falls a few feet and nobody gets hurt. 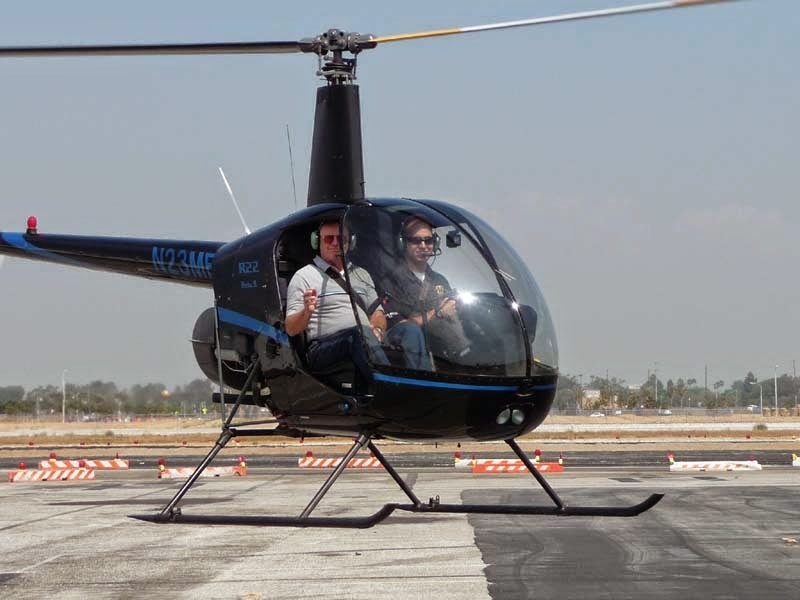 From their page it looks like it was a Helicopter experience for 2 but I guess they don't have the one for 1 person listed. At any rate I am extremely jealous! They have both listed. The 2 person is done in an R-44. The 1 person is in the R-22. It is on the top right side if you select Helicopter Flight and Los Angeles in the Gift Finder. It's not that expensive. Less than you would spend on gas going to Pismo. You should do it! Wow! That is really neat! I flew with you once didn't I? The most I remember about helicopters, other than the time Darin went for a ride the year he was with us in NY, was the way Steve Bourassa sat on our couch in Tucson, and flew a copter all over our front room. I remember that he used both hands and both feet. I can't remember whether he was in or out of Service. He loved it. I think your would need lots of concentration. Really fun, if you like that sort of thing. Very, very cool! What a great gift. I remember Steve Bourassa giving us a demonstration of flying a helicopter right in our living room on Kilburn Road. It took every extremity he had, and then some. Looks like a lot of work! I've always wanted to take a helicopter ride, but I think I would prefer doors. I have a fear of heights. Glad to hear from you. Things have been very quiet from your neck of the woods lately. Speaking of Steve Bourassa, he flew helicopters in Vietnam, by the way. He told me that during early training students were challenged to hover over a football field, keeping withing the boundaries. He said it was impossible until he got some experience. I guess he's still flying for the fire department somewhere in the Phoenix area. Like all of the commenters above, I also have always been intrigued by helicopters. Never been up in one. Would love to try sometime. Wow. That looks like fun. I'm glad you had a good time. What a cool gift. Maybe someday I can ride in a helicopter. I've wanted to since I was a little kid.